Motorola's new wearable has a round face with Corning Gorilla Glass 3 protection, comes loaded with Android Wear and retails for $249 USD. Next to the new wearables by Asus, LG and Samsung, Motorola has finally launched the long-awaited Moto 360 smartwatch. This wearable has a round face like the LG G Watch R, while most specs and features of all these new smartwatches are similar - water resistance, Corning Gorilla Glass-protected display, leather band, optical heart rate monitor and pedometer. The Motorola Moto 360 is IP67-certified for protection from water and features heart-rate monitoring and a pedometer, as mentioned earlier. "Comfortable, familiar, and crafted with the finest materials, Moto 360 keeps you up to date without taking you away from the moment," says Motorola. This smartwatch was listed on Google Play Store in the US for $249 USD and sold out in less than three hours. 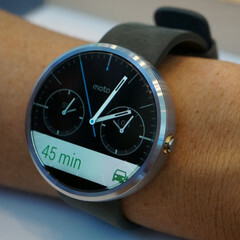 The same happened with the stock listed on Motorola.com, but it looks like more will be available soon.